The Russian game will be fun, I think it will be something around 5-1, Russia. Home pressure, need to wow the fans, Ovechkin and the guys are going to step it up. Slovenia's goalie has been solid as well. Last edited by Tim Budong; 02-18-2014 at 12:04 AM. Who's #91? Stamkos on the 4th line? oh snap...going back with price. Carey Price named Canada's goalie in men's Olympic hockey quarter-final. But Big Earl says we need him on the Canucks to win. For the life of me I can't see how Team Canada brass still apparently hopes that this Kunitz thing still works out. Bergeron Tavares and Benn were one one of the best 2 lines when they were together. I thought Anaheim and Duchene was working out pretty well in the time they were together. But St. Louis over Kunitz who's basically done nothing but take a penalty? I can't put my confusion into words. Crosby will be fine with whoever ends up on his line when games matter, so I'm not sure why Kunitz has to stay in the lineup. At least they kept one line together after it clicked (Toews). If there's one thing that's working out with the Americans, it's that they are keeping the majority of their lineup intact and lines together. Last edited by m3thods; 02-18-2014 at 08:42 AM. Their success may free up government funds to improve their development leagues. Plus the kids who are (probably not) watching might be inspired to be just like Anze! ^Not just that. It's 2-1 Latvia! Last edited by m3thods; 02-18-2014 at 10:18 AM. 1/2 on my parlay , bright side, I get a token credit. Yolo and bet on Phil Kessel for rocket trophy? hmm... 13x. From the 4 games, the fins beating Russia is one I could see. 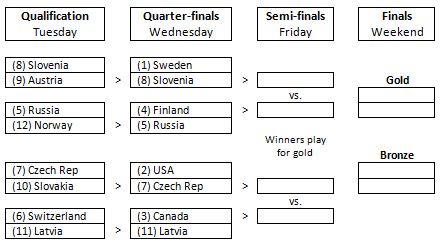 Sweden should also dominate over Slovenia, likewise with Canada over Latvia and USA over Czech. You can find the live update bracket here. Sir, I did not put a "/sarcasm" at the end of my post.